What is garlic? What is it used for? Garlic is one of the world's most well-known and widely used herbs. It has been used as a culinary spice for at least 5,000 years, and has been mentioned in both the Bible and the Talmud. Hippocrates, considered the father of modern medicine, was one of the first people to realize the medicinal properties of garlic and recommended it for many conditions, including parasites and poor digestion. The active ingredient in garlic is allicin, a sulfur-based compound that when crushed or chewed produces other compounds. Scientific studies suggest garlic supports the cardiovascular system by lowering cholesterol and triglyceride levels in the blood and reducing the stickiness of platelets. Test-tube studies show that garlic has antibacterial, antiviral and antifungal properties; human studies show that garlic reduces the risk of several cancers, particularly those of the esophagus, stomach and colon. While garlic has not been used as long in traditional Chinese medicine (it is believed to have first been used in China in the early part of the sixth century), it has become a staple of TCM. It is used to treat a wide range of diseases, including high blood pressure, athlete's foot, infections and ulcers. How much garlic should I take? Most clinical trials of garlic have used between 600-900 milligrams per day, divided into two or three amounts. An amount of this size delivers approximately 5,000-6,000 micrograms of allicin. Aged-garlic extract studies have used 2.4-7.2 grams per day. What forms of garlic are available? Garlic is available in more forms than most other herbal medicines. In addition to fresh garlic, which can be obtained from a typical supermarket, there are garlic extracts, tablets, capsules, tinctures, powders and sprays. Some companies sell odorless garlic tablets. 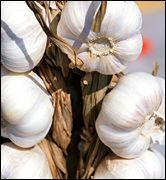 What can happen if I take too much garlic? Are there any interactions I should be aware of? What precautions should I take? Some people are sensitive to garlic and may experience heartburn and flatulence after eating large amounts. Because garlic acts as an anticoagulant, people taking blood-thinning medications or people scheduled for surgery should inform their health care provider before taking garlic supplements. Garlic appears to be safe during pregnancy and breastfeeding. Berthold HK, Sudhop T, von Bergmann K. Effect of a garlic oil preparation on serum lipoproteins and cholesterol metabolism. JAMA 1998;279:1900-1902. Blumenthal M, Busse WE, Goldberg A, et al. (eds.) The Complete German Commission E Monographs: Therapeutic Guide to Herbal Medicines. Boston: Integrative Medicine Communications, 1998. Fleishauer AT, Poole C, Arab L. Garlic consumption and cancer prevention: meta-analyses of colorectal and stomach cancers. American Journal of Clinical Nutrition 2000;72:1047-1052. Koch HP, Lawson LD (eds.) Garlic: The Science and Therapeutic Application of Allium Sativaium L and Related Species. Baltimore: Williams and Wilkins, 1996. Warshafsky S, Kamer R. Effect of garlic on total serum cholesterol: a meta-analysis. Annals of Internal Medicine 1993;119:599-605.